Dr. Steve Parker (M.D.) teaches you how to control your blood sugar and eliminate or reduce diabetes drugs by working with Nature, not against her. You’ll even lose excess weight if needed. 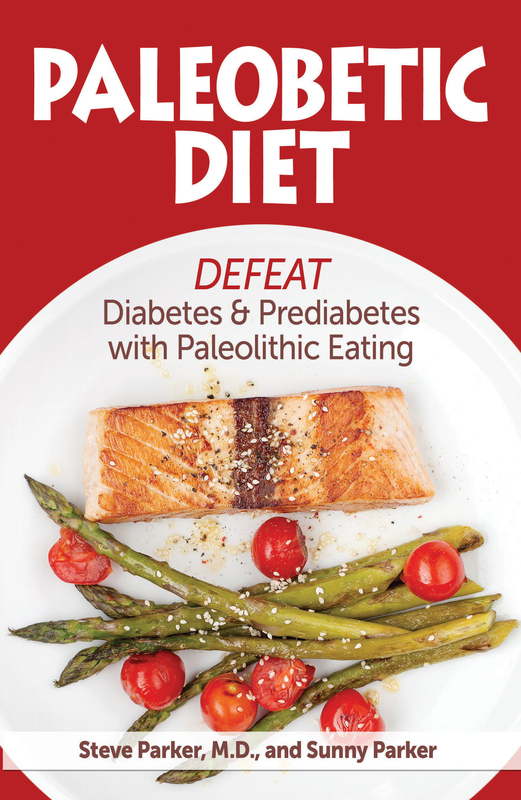 This is the first-ever Paleolithic-style diet created specifically for people with diabetes and prediabetes. Dr. Parker and his co-author wife provide one week of meal plans to get you started, plus additional special recipes. Meals are quick and easy to prepare with common ingredients. You’ll find detailed nutritional analysis of each meal, including carbohydrate grams. Steve Parker, M.D., has three decades’ experience practicing Internal Medicine and treating patients with diabetes and prediabetes. His other major areas of interest are weight loss and physical fitness. He and his wife Sunny live in Scottsdale, Arizona USA. Dr. Parker’s other books include The Advanced Mediterranean Diet: Lose Weight, Feel Better, Live Longer (2nd Ed. ), Conquer Diabetes and Prediabetes: The Low-Carb Mediterranean Diet, and KMD: Ketogenic Mediterranean Diet. You’ll find Paleobetic Diet at all major online bookstores. For example, Amazon (paperback book in U.S.), Kindle ebook, and multiple ebook formats at Smashwords.